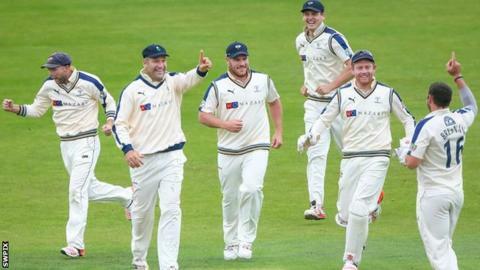 Unbeaten Yorkshire are aiming to set a new record points total as they close in on winning the County Championship for a second successive season. They are 43 points clear at the top of Division One and only need six points from this week's game against second-placed Middlesex to retain the title. "We need a handful of points and we're set on doing it this week," bowler Steven Patterson told BBC Radio Leeds. "We're on course for the record points total since it became two divisions." The County Championship was split in 2000 and the top-flight record is the 257 points that Sussex picked up in 2003, although Somerset collected 266 points when they won Division Two in 2007. Yorkshire are on 241 points with three matches remaining and 31-year-old Patterson, who has taken 43 Championship wickets in 2015, thinks his side's winning run can continue beyond this season. "If you see the team we've had and how many players we've missed then there seems to be no reason why we can't repeat it for the next three or four years," he added. Despite their Championship success, Yorkshire's hopes of winning the One-Day Cup ended on Sunday when they suffered an eight-wicket loss to Gloucestershire in the semi-final at Headingley.